CSB recommendations receive mixed support from Agricultural Retailers Assn. 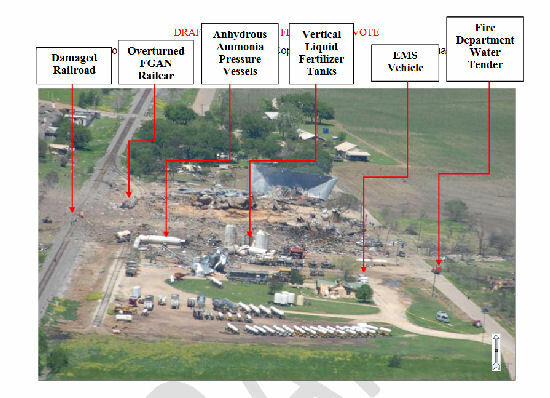 This week, the U.S. Chemical Safety & Hazard Investigation Board (CSB) released a report of findings and recommendations after the April 2013 explosion at a West, Texas, fertilizer plant. The report makes recommendations for the Environmental Protection Agency, Occupational Safety & Health Administration (OSHA) and Federal Emergency Management Agency. The violent detonation fatally injured 12 emergency responders and three members of the public. Local hospitals treated more than 260 injured. The blast completely destroyed the West Fertilizer Co. (WFC) facility and caused widespread damage to more than 150 off-site buildings. The report listed key issues of regulatory oversight, fertilizer grade ammonium nitrate storage practices and emergency planning. The U.S. Chemical Safety & Hazard Investigation Board concluded that the construction of the bins and other building materials, as well as the lack of an automatic sprinkler system, plausibly contributed to the detonation. CSB's analysis of the emergency response concluded that the West Volunteer Fire Department did not conduct pre-incident planning or response training at WFC, was likely unaware of the potential for fertilizer-grade ammonium nitrate (FGAN) detonation, did not take recommended incident response actions at the fire scene and did not have appropriate training in hazardous materials response. CSB found several shortcomings in federal and state regulations and standards that could reduce the risk of another incident of this type. These include OSHA's Explosives & Blasting Agents and Process Safety Management standards, EPA's Risk Management Program and Emergency Planning & Community Right-to-Know Act (EPCRA) and training provided or certified by the Texas Commission on Fire Protection and the State Firefighters' & Fire Marshals' Association of Texas. The location of the WFC relative to the surrounding community exacerbated the off-site consequences, leading CSB to assess whether other FGAN storage facilities could pose significant off-site risks. CSB's analysis shows that the risk to the public from a catastrophic incident exists at least within the state of Texas, if not more broadly. For example, 19 other Texas facilities storing more than 10,000 lb. of FGAN are located within 0.5 miles of a school, hospital or nursing home, raising concerns that an incident with off-site consequences of this magnitude could happen again. CSB recommended that a guidance document on EPCRA requirements be issued annually to State Emergency Response Commissions (SERCs) and Local Emergency Planning Committees (LEPCs). “Increased education and training, along with drills involving local facilities and the area first responders is necessary to foster strong LEPCs in rural areas,” ARA said. ARA also supports the statutory elimination of the agricultural exemption under EPCRA Section 311(e)(5), which it said has only led to confusion among facilities on what fertilizer products are required to be reported to LEPCs and local responders. CSB also recommended that EPA add FGAN to the list of regulated substances under the Risk Management Program (RMP). ARA disagrees with this recommendation because RMP is a Clean Air Act program created to address the release of toxic substances into the air. A pressurized liquid nitrogen fertilizer such as anhydrous ammonia (NH3) is properly included under RMP as a toxic inhalation hazard (TIH) chemical. FGAN is a dry, solid nitrogen fertilizer product. “It does not pose an air release hazard, which is the primary focus of EPA’s RMP regulations,” ARA said. ARA also believes OSHA should work with industry on updating existing FGAN regulations under 29 CFR 1910.109(i). OSHA has existing authority to regulate the storage and handling of FGAN under 1910.109(i) and anhydrous ammonia under 1910.111. “Adding FGAN to the list of products covered by the PSM standards (1910.119) would be inappropriate, as these regulations are intended for manufacturing facilities,” ARA said. As pointed out in the CSB report, like most agricultural facilities, West Fertilizer did not manufacture products on-site. It was a distribution center for farm supplies to local farms and ranches. Including FGAN in PSM would only lead to more complicated and expensive federal regulations without addressing the primary causes of the tragic accident.